As part of the work of putting together the ‘Virtue and Vice’ exhibition, I got to return to a question that has fascinated me for a long time: women’s reading in the early modern period. Though moralists fulminated against the perils of women’s reading, and warned that it was likely to lead to all sorts of venereal vices, there is good evidence to show that women read widely, and that they enjoyed devotional and religious literature alongside a wide range of fictions, poetry, and other writings. The diary of Elizabeth Isham, a Northamptonshire gentlewoman, shows that even where women did know about books’ dangerous reputations, they didn’t necessarily pay much attention. Isham records that for around two years, in the mid-1630s, she spent her mornings reading John Foxe’s massive protestant martyrology, the Acts and Monuments (commonly known as the Book of Martyrs). In the evenings, she turned to lighter fare, reading the Arcadia, a long prose Romance by Sir Philip Sidney, and then Spenser’s epic poem The Faerie Queene (which she preferred). Isham writes that the books were ‘much comended by some. and others againe discomended the reading of such Bookes of love. but I found no such hurt’, though she wryly recognises: ‘I suppose there are play Bookes which are farr worse then these which my father would lend me none of’. We know little about Bess of Hardwick’s reading. Famously, her 1601 inventories only list six books. At Chatsworth, the low wardrobe housed ‘a great olde bible’, alongside a watering pot and a colander. Bess’s bedchamber at Hardwick New Hall – where our exhibition is located – was home to ‘my Ladies bookes viz: Calvin upon Jobe, Covered with russet velvet [Calvin was one of the most influential of the European reformers], the resolution, Salomans proverbs, a booke of meditations, too other books Covered with black velvet’. The rich coverings of the books remind us of Bess’s wealth, and encourage us to think about what it felt like to read a velvet-covered book amongst the sumptuous fabrics that decorated Bess’s grand home. A rare copy of the 2nd edition of Persons’ Resolutions. ‘The resolution’ was the bestselling A book of Christian exercise, appertaining to resolution, that is, shewing how that we should resolve our selves to become Christians indeed. Like Bess, who lived through the English Reformation, and successfully negotiated the sudden religious and political changes the marked the mid-sixteenth century, the Christian exercise changed religion during its lifetime. It was written by a Jesuit priest, Robert Persons and printed in Catholic Rouen in 1582. Persons hoped it would persuade English Catholics to remain faithful, and win back Protestants to the Catholic faith. In 1585, Edmund Bunny, a clergyman, decided that Persons’ lively prose would work equally well in the opposite direction. He published a new, lightly-revised edition with a ‘Treatise’ persuading Catholics to return to the English Church. Persons was horrified, and rushed to publish his own new edition. 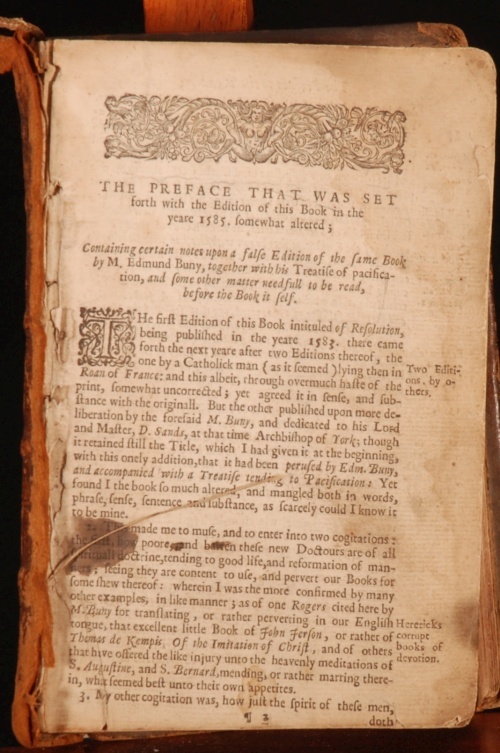 In the image above, you can see the opening of Persons’ amended preface, protesting that Bunny had ‘mangled’ his book ‘in words, phrase, sense, sentence, and substance’. Yet Persons used Bunny’s project to his own polemical advantage. Citing several other examples of Catholic books which English Protestants had been busy ‘translating, or rather perverting’ (the antithesis to a positive conversion! ), Persons lamented that Protestant writers had so few resources, and so little skill that they had to plunder Catholic writings, ‘mending, or rather marring, therein, what seemed best unto their own appetites’! 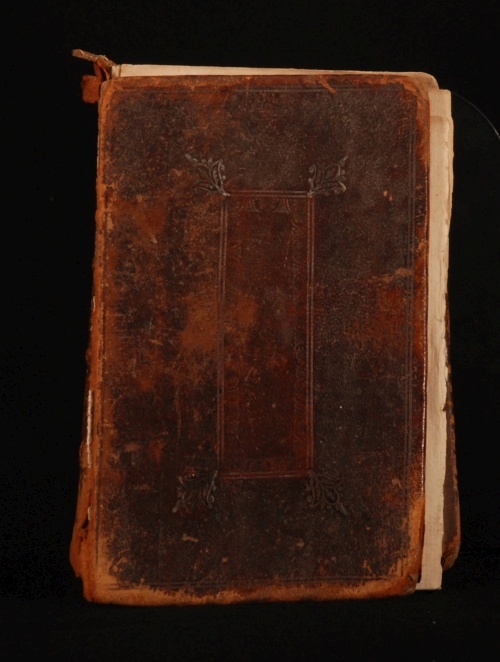 The fate of Persons’ book is a neat reminder of how central the printed word was both to devotional life, and to efforts surrounding conversion. Both Bunny and Persons hoped the Resolution would persuade people either to change faith, or to remain devout, even as they applied it in radically different contexts. The book’s presence in Bess’s bedchamber is a vivid reminder that Persons’ book (presumably in Bunny’s edition) were read and used, and that the histories of books mirrored the lives and preoccupations of their owners in rich and intriguing ways. 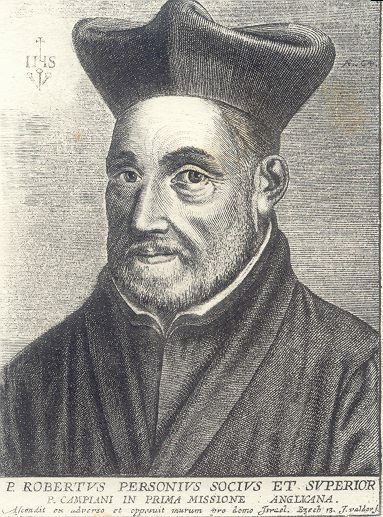 This entry was posted in Case studies, Resources, Texts, Virtue and Vice and tagged Hardwick, Hardwick Hall, Helen Smith, Jesuits, Reading, Robert Persons, Virtue and Vice. Bookmark the permalink.